Standard toilet paper holders are so...ho-hum. Here are five eye-catching alternatives that are guaranteed to add delight to every bathroom visit. 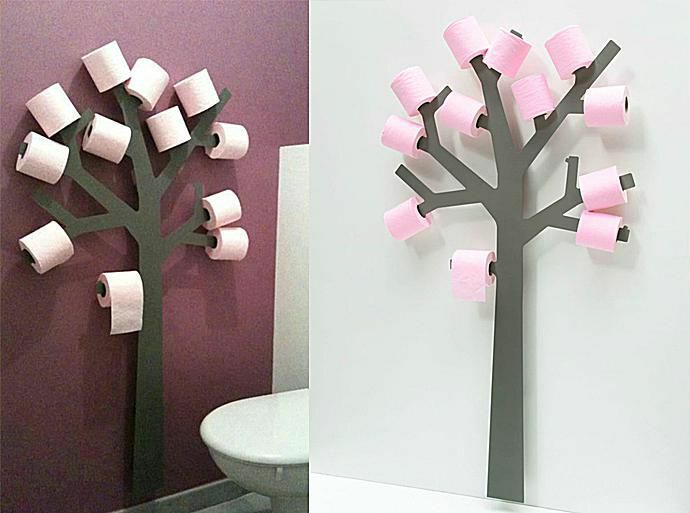 If your bathroom's short on storage space, the TP Tree could be one fantastic de-clutter solution. No longer will your guests need to rummage desperately through your cabinets when the last sheet runs out, or reach for a backup roll stacked in a precarious pyramid behind the loo. Instead, spares are neatly displayed on the tree's outstretched branches. The TP Tree is made of lightweight lacquered steel that is simple to mount on just about any wall. This tree is available in white, green, black or gray. If you crave colorful toilet paper, you may need to buy it from overseas. The way I see it, the world is divided into two types of people: Folks who claim that they never bring a digital device into the bathroom, and the rest of us who tell the truth. That means that pretty much anyone who owns a smartphone or tablet will appreciate the genius of this combination iPad and toilet paper holder. Manufactured by CTA Digital, the device features a flexible gooseneck that adjusts to any viewing angle, allowing the user to enjoy apps, eBooks, videos and web browsing from the comfort of their own throne. In fact, you may never need to leave the bathroom again. It takes a strong man to support a soft roll. Or two. This cool accessory is great for kids' bathrooms or the bathroom in a bachelor pad. The bright color contrasts against your typical white porcelain toilet. Propped on the toilet tank or a nearby shelf, Mr. T takes care of the heavy lifting in your bathroom. Available in red or blue from Monkey Business. The giraffe's long neck evolved so it could graze on very tall trees. Who knew it would also make a handy holder for several spare t.p. rolls? The long neck can hold two or three extra rolls. This petite beast is made of sturdy cast iron and measure 18.5 inches high. The style is vintage, the look hand-made. It's the perfect gift for the animal lover in your life, or for a safari-themed kids' bathroom. Fans of industrial design will love this steel-pipe toilet paper holder, guaranteed to handle the biggest and baddest rolls in the house. It's handmade in the U.S. and crafted to order from Etsy. Soft like a cloud? Maybe. But now you can literally make toilet paper clouds with this nifty shelf-style toilet paper holder. The shelf is shaped with curves, which makes a stack of toilet paper look like the puffs of a white cloud in the sky. The grey color adds a neutral accent to your bathroom decor and looks just right against white rolls of t.p. Add a futuristic touch to your bathroom with this sphere-shaped toilet paper dispenser. Available in several bright shades, this dispenser hides the roll while making paper easily available through a slit. This style is perfect for modern and colorful decors. It could even work with a 60s retro-futuristic look, thanks to the spherical shape and saturated color.